I hope you all are enjoying your Labor Day! I had a very productive morning that included: a run, laundry, vacuumed, cleaned bathrooms, cleaned kitchen floor, and cleaned appliances. After lunch, the hubs and I headed out to do a little shopping for some fall decor and jeans for him. We came home with some cute decorations and a couple shirts for him, but no jeans. He has the longest legs ever which makes the search a little more challenging. Not to mention, he is quite picky. 😉 I guess that’s a good thing when you’re spending money though, right? After we got home, I decided to search for a healthy snack to make for Cody’s lunches throughout this week. 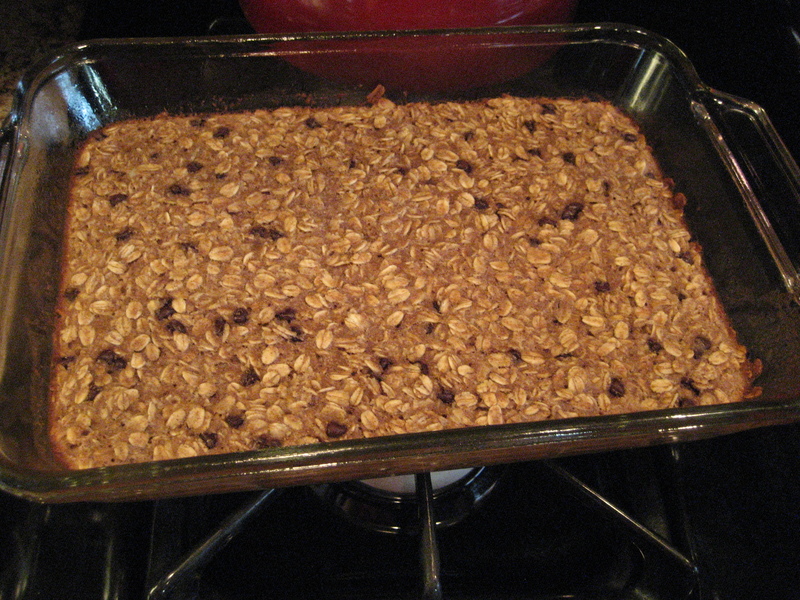 I looked through several blogs and decided on fANNEtastic food’s Dark Chocolate Granola Bars. Anything that resembles a chocolate chip cookie is right up Cody’s alley, so I thought this would be a good choice. I followed Anne’s directions, but I excluded the walnuts and used semi-sweet mini chocolate chips instead of dark chocolate chips. 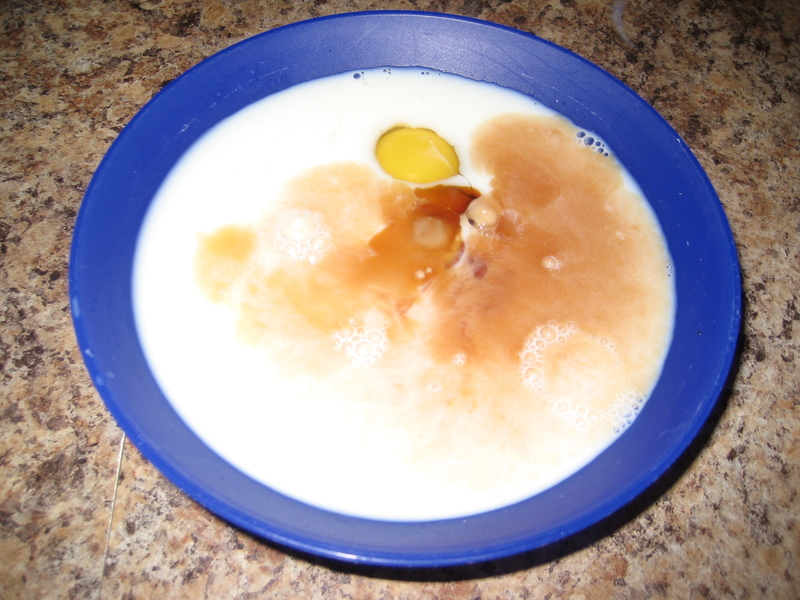 Make sure to find the recipe here. 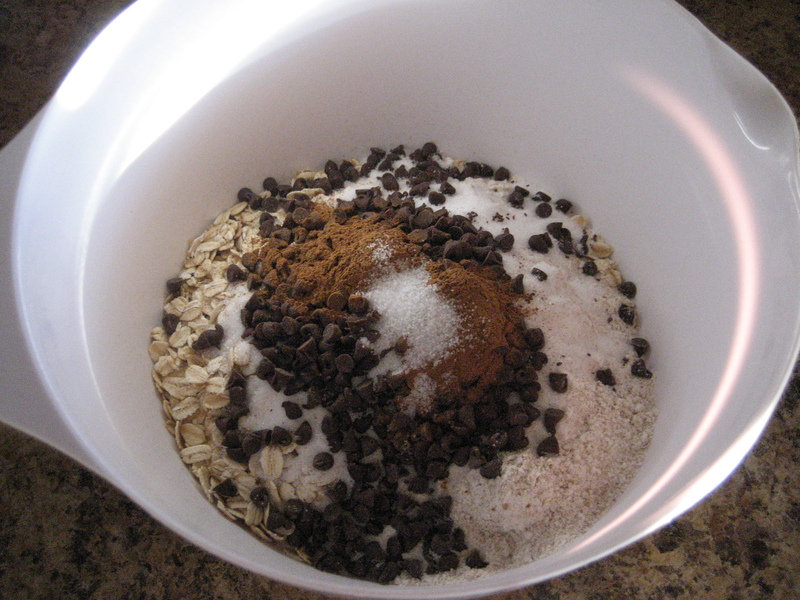 First, I separated the dry ingredients and wet ingredients in different bowls. 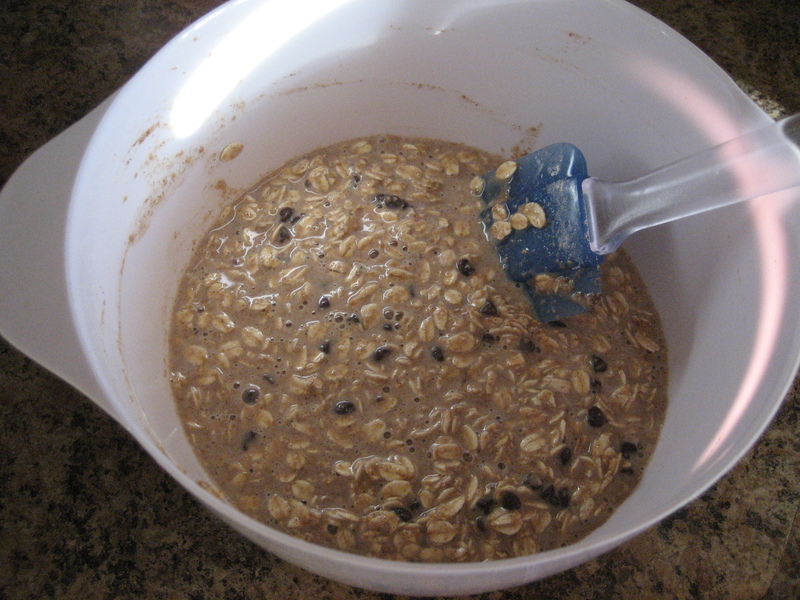 Then I mixed all of the ingredients together with a spatula until thoroughly blended. I poured the batter in a greased 11×7 baking dish and baked it in the oven at 375 degrees for 30 minutes per Anne’s directions. This delicious looking dish came out of the oven when the kitchen timer when off. I let it cool and cut it into 8 bars. So far, Cody has already eaten a couple of them, so they must be pretty good! Stock the refrigerator and pantry with fruits, yogurt, and other healthy snacks that he enjoys. Remind him that there are his favorite ______ in the refrigerator so that he’ll eat regularly. Pack his lunch with healthy snacks and fruits. Always include at least one vegetable at dinner. Make homemade healthy treats/snacks on Sunday or Monday for him to munch on throughout the week. What homemade healthy treats/snacks do you like to make? Does your significant other eat healthy? If not, how do you encourage him/her to make healthy decisions without being annoying about it? My head is swirling with several random thoughts this afternoon, so I decided to warp this post into one big post of random thoughts, ideas, and stories. Ready, set, go! Random Thought #1: Like my new header?! I’m so excited about it. I have been wanting a more attractive header for quite some time now, but I wanted to make sure I explored my options. I knew that I certainly wasn’t going to try to do it because God knows I am not technologically savvy in any way, shape, or form. I was initially unsure of what I wanted my header to look like and who I wanted to do it. Well I found a miracle worker, and her name is Julie at Savvy Eats. She is so easy to work with, does great work, and definitely knows what she’s doing. Make sure to check her out if you’re in the market for a new blog design! Random Thought #2: I had this amazing little combo for lunch today. 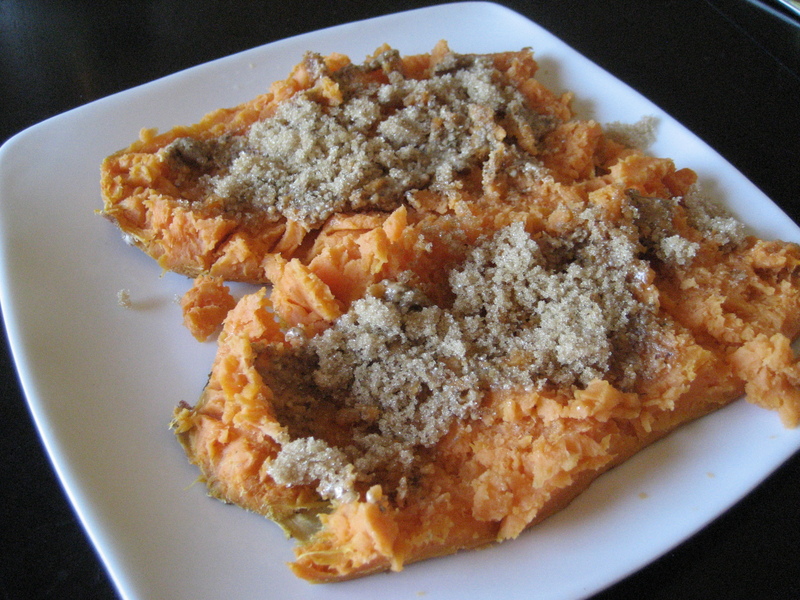 It consisted of a sweet potato (obviously), almond butter, and a sprinkle of brown sugar. I never knew three ingredients could be so perfect together! Tessa at Amazing Asset gave me the idea to spread some almond butter on the sweet potato, and I’m so glad I tried it out. Talk about a filling little lunch! 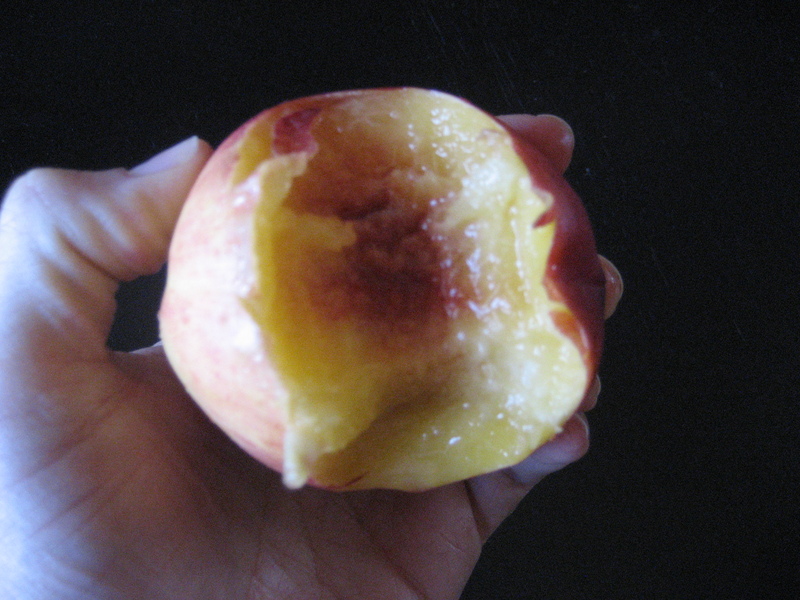 Random Thought #3: Who is in love with peaches and/or nectarines?! *Excitedly raises hand* I AM!! Peaches and nectarines are easily one of my favorite fruits of all time! (I really can’t decide which I like better.) I paired a nectarine with my sweet potato (see above) today for lunch, and I couldn’t believe how juicy, sweet, and delicious it tasted. I’m going to gobble up as many peaches and nectarines as I can before they go out of season! Ok, I’ll leave you with those thoughts for now. Don’t want you feeling too overwhelmed with my randomness! Do you prefer peaches or nectarines better? How many “rest days” do you take each week? 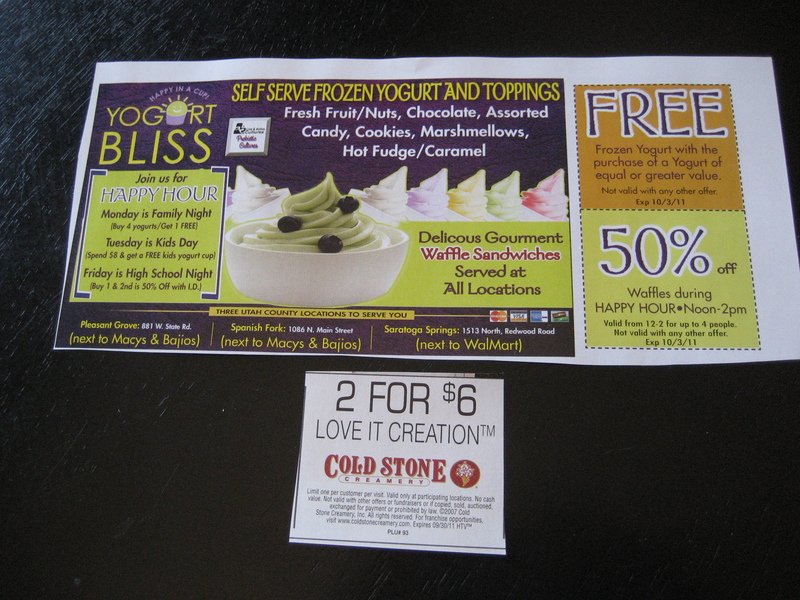 Do you like ice cream or frozen yogurt better?